RAW show in Portland! First PDX RAW artists showcase! I'll be having my first Portland show Feb 17th! I'm super excited and nervous and motivated and and and...! I was contacted last week, so I have some serious crunching to do. But, if you know me well, you know that I work great under pressure. I'm really excited to see the other artwork, performance art, film and dance my booty off at the end of the night. So you Portland people, I really hope to see you! Experiments in Unemployment: Dialogues: "Original Painting by Amy Willis Continuing with our Dialogues series we meet Amy Willis from Astoria who is a fellow artist! Amy and I hav..."
Peep the Blue Jays in the window! my new book, originally uploaded by jody9. 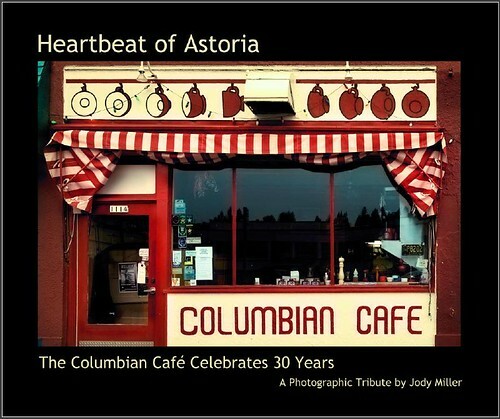 This is a book that came out recently about lovely Astoria. Jody Miller is a wonderful photographer! If you look closely, you can see 4 little Blue Jay postcards in the window. Those are my cards for my first show in Astoria! Neat!